Russia’s economy grew at the fastest pace in six years in 2018, outstripping economist estimates, as construction got a boost from the World Cup and the start of natural gas project in Siberia. Growth accelerated to 2.3 percent, the most since 2012, after construction surged, the Federal Statistics Service reported in its first estimate Monday. The majority of analysts polled in a Bloomberg survey forecast growth of 1.9 percent for the year and the highest estimate was for 2.2 percent. 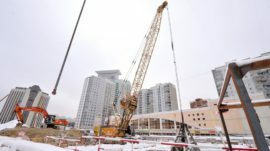 Economists have questioned whether the pace of growth is sustainable and how much of it was artificially boosted by one-off factors such as the start of Novatek PJSC’s $27-billion Yamal LNG project. The 2018 football World Cup also appeared to provide a boost to the restaurant and hotels sector, which expanded 6.1 percent. Very little of the impact is filtering through to consumers, who are struggling amid stagnant incomes and rising inflation. Russia is still punching well below its weight compared to emerging-market peers and its own performance before recession struck in 2015. Putin promised after his election last year to bring growth to a level that exceeds the global average of 3.7 percent by the end of his six-year term. Economic growth is expected to slow this year and the central bank warned Friday that first-quarter numbers may come in below expectations after investment activity weakened in December.